Chandimandir, February 7: Adopting the Go Green initiative, Lieutenant General Surinder Singh, General Officer Commanding-in-Chief, Western Command inaugurated a 2 MW solar power plant at Chandimandir. 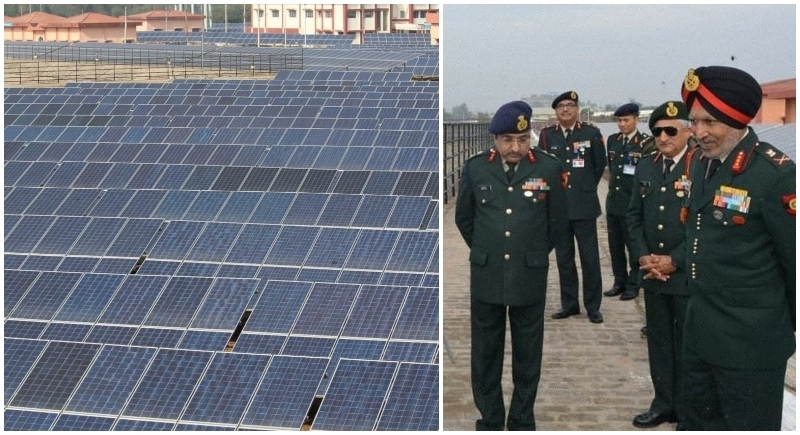 This is the largest Solar power project within Western Command of the Indian Army, set up at Chandimandir. Considered as one of the largest, the solar power plant in Panchkula (Haryana) was established with an investment of Rs 10 crore. The plant will generate at least 29.5 lakh units of electricity annually or about 2.45 lakhs per month amounting to approximate savings of more than Rs 2 crore annually to the Government Exchequer. A total of 6250 solar panels of Indian origin and solar cells have been set up to generate 2 MW of solar energy. The solar power project spans across 9.5 acres spreading up to the Mansa Devi Pump House and is a benchmark in the unique design model put on ground under the supervision of Garrison Engineer (U) Chandimandir. Using the source of solar power plant, India has considerably generated electricity through renewable energy. Likewise, Ladakh successfully connected to Kashmir with 220kV transmission system. Ladakh will get power in winters & surplus power will be evacuated in summers.